It seems so long ago that an up-and-down software-as-a-service legislative journey ended successfully with passage of now Senate Enrolled Act 257. The bottom line: Indiana put a definitive stake in the ground, becoming just the fourth state to clearly establish that it will not tax such SaaS transactions. (Summary on Page 2 here). But with the 2018 Indiana General Assembly not wrapping up its work until a one-day special session in mid-May, an evaluation of the legislators’ work and a review of how members benefitted from Indiana Chamber advocacy have just recently been released. 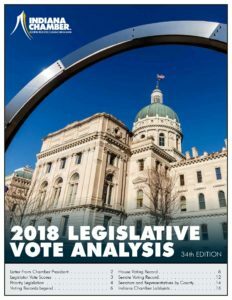 The 2018 Legislative Vote Analysis, as the name suggests, grades lawmakers on their support for pro-economy, pro-jobs initiatives. Scores for 2018 range from 47% to 100%. Two Chamber priorities, however, are not included in the analysis as they did not advance to the floor for full votes due to leadership decisions. Those were efforts to raise the smoking age to 21 and reform the state’s smallest townships. View the full report or one-page summary of legislator scores. What do the Chamber efforts mean for your organization? If you have 10 employees, it’s $2,280; for 25 employees, $5,700; or 100 employees, $22,800. View the 2018 Legislative Return on Investment. This entry was posted in Business News, Chamber News, Government, Legislation and tagged 2018 Legislative Vote Analysis, Legislative return on investment, legislators, ROI, SaaS, scores, software as a service by Bill Waltz. Bookmark the permalink.